Are Chicken Wings your Thang? Well for Ain't No Thang, it Ain't No Thang. Some of the wing sauce concoctions you can see below are like a flavor explosion of chicken wing goodness. Having a Super Bowl Party? A Graduation? What if you just want a Backyard BBQ and you can't cook a hot dog? 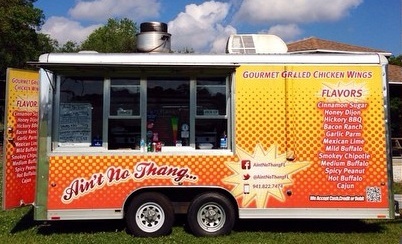 Well, this truck caters to please the crowds, use the Book Now link in the navigation and Request Ain't No Thang Today. Tossed in one of our unique flavors! Grilled Boneless Wings (6oz) Tossed in one of our unique flavors! Gourmet Grilled Chicken Sandwich -Tossed in one of our unique flavors!